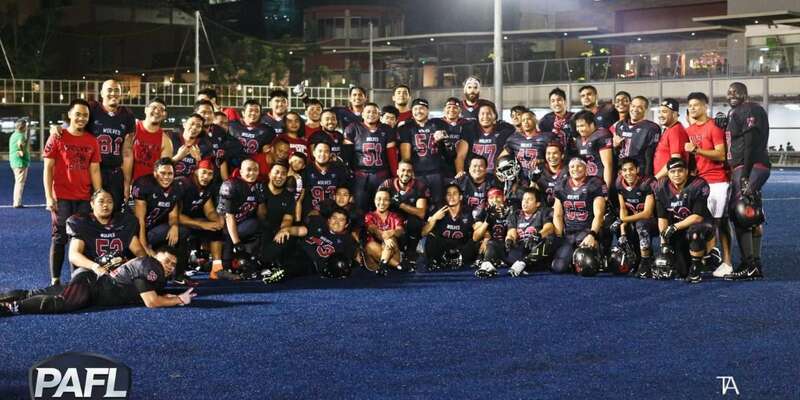 Makati City – It was a great day for American football as fans from both the Wolves and Rebels watched the second game of the season opener for the 3rd season of the Philippine America Football League. A huge turnout of people came to watch the games to show support to their favorite teams. 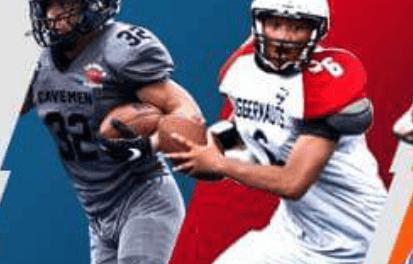 It was a game that many looked forward to seeing as the Rebels make their debut to the PAFL and face the defending champs. The game started off with the Rebels’ offense. They focused on run plays with attempts from running backs Jec Castolome and Benjamin Bautista. Castolome tried to run through the middle but could not penetrate the Wolves defensive line. Bautista tried running the ball outside but Wolves linebacker Francis “Jeeko” Bataclan was there to make the stop. Their third attempt had no gain so the team decided to punt for their final down. The Wolves gave a quick pitch to running back Joshua Gayta who gained 8-yards before being pushed out of bounds by Rebels’ linebacker Marlowe Evangelista. Their second attempt was a pass to wide receiver Ivan Klaric who caught the ball 10-yards before the end zone and gave the pack a fresh set of downs. Running back Dennis “Yaboye” Graves was able to get the offense further into the red zone. Quarterback Luke “Zman” Zetazate passed the ball to Klaric for their first touchdown. They secured their extra point giving the Wolves a 7-point lead. The second quarter began with an incomplete pass from the Rebels. Things didn’t look so well as the referees called a false start on the offense and resulted to a 5-yard penalty. Castolome led the offense with multiple run attempts but resulted to loss of downs. Wolves defensive line Brian Raymond was able to push Castolome right before the end zone with an assist from defensive end Jason South. 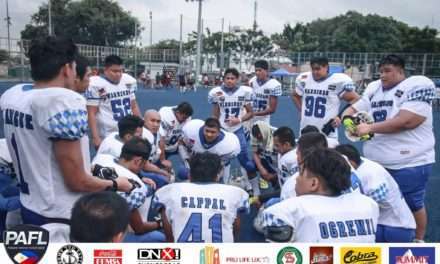 Duane Barsabal assumed the position of quarterback as the offense decided to go for their fourth down but the defense scored a safety as linebacker Hiroyuki Kano tackled Barsabal right after the snap. The Wolves now have possession and the score was at 9-0. Gayta made a 40-yard run before being pushed out of bounds by linebacker Benedict Ibu. Graves made an outside run and gained a few more yards before being tackled by Ayebu-Lamai and Clyde Villanueva [safety and cornerback]. Graves was still the running back when they took the play to the middle where he was stopped by defensive lineman Pocholo Ricafort. The Wolves scored another touchdown with Gayta’s reception right at the end zone. However, they were not able to get the extra point which makes the score 15 to nothing. With no points yet in the game, Rebels’ quarterback BJ “The Chief” Padua mixed it up by using offensive lineman Byran Malimban as running back. 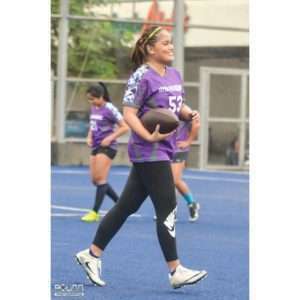 Richard Artista, Wolves defensive lineman, was able to penetrate the offensive line of the rebels and forced Malimban to do an outside run where Kano [Wolves linebacker] assisted with the tackle. Padua hands Malimban the ball again but Ben Affainie [Wolves defensive lineman] forced a fumble that was recovered by the Wolves. David Jumola, also a running back from the Wolves, ran up the middle and got a first down just before he was stopped by defensive lineman Rony Romero. The pack struggled as incomplete passes were made to receivers. With only 8 seconds left in the first half, Klaric was able to score a touchdown during their last attempt. Scoring another extra point, the Wolves now have a 22-point lead as the first half of the game ended. Fans were cheering at the start of the 3rd quarter as the pack scored another touchdown in their first play. Zetazate gave a quick pass to De la Peña who ran the ball all the way to the end zone from the 30-yard line. The pack secured their extra point again for a score of 29-0. Wolves kicker Mark Hill did an on-side kick that was recovered by the Wolves. This gave them possession of the ball. At this point, the Wolves were already up by 36 points after converting their extra point. The Rebels showed determination as Castolome gained 5-yards with an outside run before being stopped by Affainie. Vince Gamad, another Rebels’ running back, ran the ball up the middle to get a 3-yard gain. A quick pass was given to Castolome but was tackled out of bounds by safety Dags Mambuay. Fourth and inches away from the first down, Padua did a quick handoff to Castolome who pitched the ball back to the quarterback. Padua was able to see wide receiver Duane Barsabal who made the catch. He was taken down by Mambuay right after the reception. The offense was able to start at 20-yards away from the end zone with a fresh set of downs. However, due to a bad snap, the live ball was recovered by the Wolves defense. Frustrated by this turnover, the Rebels called for a time-out with about 5:30 left in the 3rd quarter. Jumola caught the quick pass and was able to gain 9-yards before he was tackled by linebacker Jeremy Smoot that was assisted by Benjamin Bautista. The pack went back to running the ball as Jumola gained another 11-yards with a first down before being taken out of bounds by Ayebu-Lamai [Rebels Safety]. After an incomplete pass to tight-end Martin Antonio, the offense decided to do another run play with Jumola who almost made it to the end zone but was stopped 5-yards away. Being close to a touchdown, the pack opted to run the ball to the middle but Jumola was stopped by defensive lineman Romero. Antonio was able to score a touchdown after. Another extra point in, the score was now 43-0. The Rebels recovered the on-side kick and started their offense at their 40-yard line. However, their trick play went wrong as the fumble was recovered by Bataclan [Wolves]. Klaric stepped in as quarterback and ran the ball out of bounds with a 5-yard gain. John Roy Moring [Running Back] went to the middle with another 2-yard gain. With a fake hand-off to Moring, Klaric was able to run the ball all the way to the end zone with another touchdown. The Wolves got another extra point with 1:51 left in the 3rd quarter. The score was now 50 to nothing. The Rebels started at their own 10-yard line with a short pass to wide receiver Geo Lapuz. Linebacker Darwin Gonzales, assisted by Larry Favorito [Linebacker] and Jeremy Musni [Defensive Back], made the stop right after the reception. The offense advanced a few yards but was unable to complete a pass in their next play. The defense stopped another play as Artista [Defensive Line] went through the middle which forced Ryan Tamondong [Quarterback] to step back further. Bataclan [Linebacker] went in for the tackle that was also considered a safety. The final quarter started with the Wolves’ 52-point advantage. Gayta gained another 5-yards for the offense. After an incomplete pass, the pack scored another touchdown with a pass to wide receiver Paolo Gomez. However, their extra point was not counted leaving the Wolves with a score of 58 to nothing. The Rebels recovered the on-side kick and started at their own 35-yard line. Things did not look so good for the offense as Padua [quarterback] was not able to complete a pass to his receivers. He was sacked behind the line of scrimmage by Marco Cordova [defensive line] shortly after which meant loss of yards. 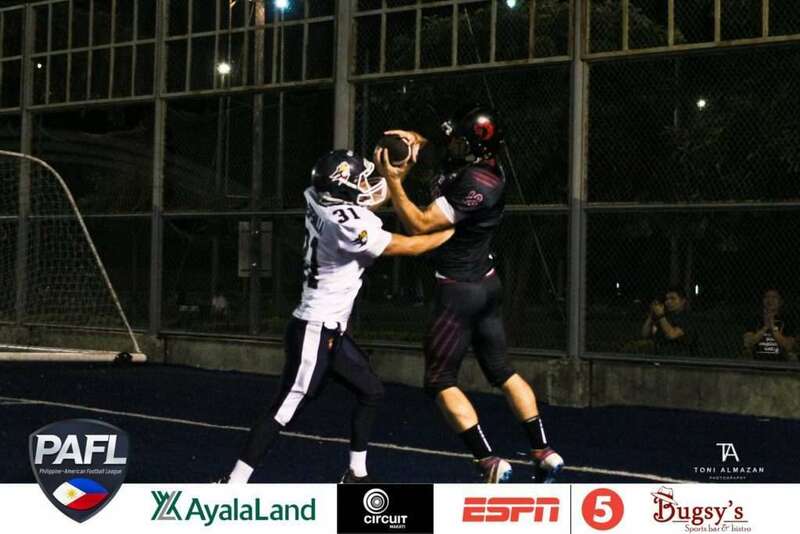 But the defense did not stop there as cornerback Lorenzo Abaya went for an interception which gave the pack another touchdown. This time, the Wolves went for a 2-point conversion with Graves as running back. The score was now 66-0. Castolome [Rebels] tried to get through the middle but was unsuccessful. He did it once more but was caught by Favorito who was penalized [15-yards] for excessive roughness. 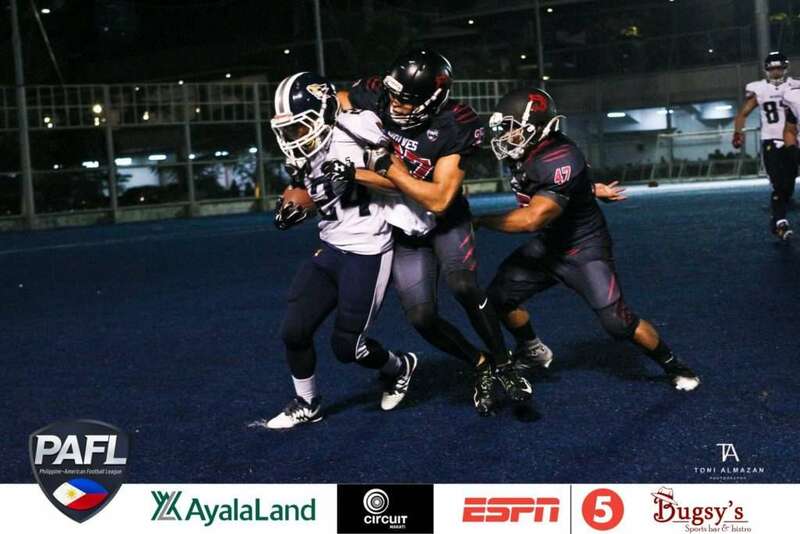 With the advantage of the penality, Bautista [Rebels running back] tried to gain more yards but was stopped by defensive back Jerome Bautista. They were able to gain another 2-yards with a quick pitch to Castolome but was tackled out of bounds by linebacker Justin Gunnacao. However, the defense made sure that they will not progress as Castolome was pushed back by Pete Macaranas [defesive back] and tackled by Jason South [defensive line] – leaving the offense with a loss of yards. They went for their fourth down which quickly became a turnover as Mambuay stopped another run by Castolome before he can further gain yards. 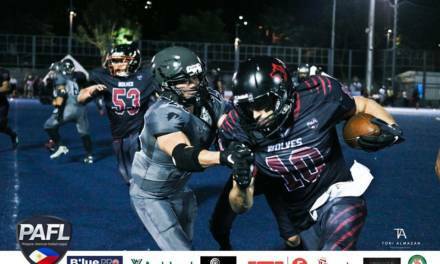 The Wolves immediately scored after the turnover with a touchdown by De la Peña and a 2-point conversion run by Jumola giving a score of 74-0. With only 5 minutes left in the game, the rebels started at their own 20 but were instantly stopped as the Wolves scored another safety. The game was at 76-0. The Wolves got two first downs with a run by Graves followed by a pass to De la Peña inches away from the end zone. Even with a new set of downs and already in the red zone, the offense struggled and scored only on their final attempt with a pass to Antonio. They opted to go for a 2-point conversion and was able to score with a QB [quarterback] run by Klaric. The Wolves were now up by 84 points. 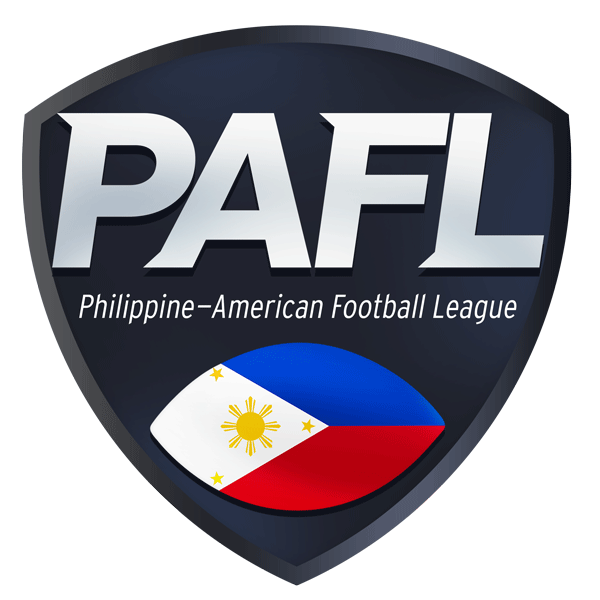 At this point, they were able to beat their previous PAFL record of 81 points in a single game. The Rebels offense struggled to score. An incomplete pass was made, followed by a run by Castolome that was immediately stopped by Bataclan. They lost yards on their third down as Catolome was tackled by Artista before the line of scrimmage. They decided to pass the ball to Barsabal but was quickly deflected by defensive back Khalil Tan. With a turnover of downs, the Wolves got possession again with only 55 seconds left in the game. The pack decided to take a knee ending the score at 84-0. The Wolves once again made PAFL history as the team who scored most in one game. Playing coach and team owner, BJ “The Chief” Padua, on the other hand, said the team welcomed the loss since they are coming into this season with a roster full of rookies playing their first game against a fully loaded lineup. “We have lots of respect for the Wolves and we’re honored that they were our opponents on our first game. We may have lost, but we lost together as a team.” The team will head back to the drawing board to talk about their mistakes, correct them and take all the necessary steps to avoid any more mishaps. 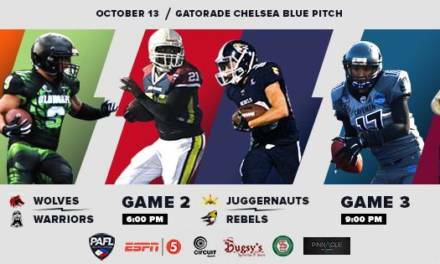 The Rebels are looking to bounce back against the Juggernauts on September 22, 6:00 PM in Blue Pitch, Circuit Makati. The Wolves will face Datu, who also won their first game, on September 8, 2018, at 7:30 pm. Don’t forget to wear red!